We started 2018 with participating in performing Carmina Burana together with Ringstedkoret and the symphony orchestra Euphosyne. We performed it at two great venues, and it was a success! Later in the Spring we performed in Tivoli at the annual choir festival, and just before we went on Summer break we performed at Hundige Church's Summer festivities. After the Summer break, we had our traditional Summer party before kicking off the Autumn season. In October we performed at the Choir Festival in Bethesda in Copenhagen, and in November we went to Kalundborg for a rehearsal weekend before our two Christmas performances, The 9 Readings and our Christmas Concert in Mosede Church. The theme for this years Christmas Concert was "Winter and snow", and it was a very beautiful concert. 2017 was yet another action packed year for Hundige Choir. As always, we started up with a New Year Banquet to meet and greet and get ready for the 2017 season. The Winter and Spring we dedicated to prepare for our upcoming trip to Antwerp, Belgium in May. Right before we took off, we had dress rehearsal concert in the public library of Greve. The trip to Antwerp was a great success and a great experience for the choir. Our hotel was situated right in the center of Antwerp - just across the street from the fantastisk central station of Antwerp. Even the weather celebrated our stay there with sun and temperatures of 25-30 degrees, far better than the average Danish Summer day! We had two larger concerts in Antwerp plus a "pop-up" concert at a square in the middle of the city. Our two church concerts were at Saint Pauls Church in central Antwerp, a beautiful medievel church with phenomenal accoustics, and at Sint-Anna Church at the left bank, a more modern church with fantastic glass mosaics. Both beautiful venues! On the day between the two concerts, the choir visited Brugge, and had a marvellous - yet very hot - day there too. The trip to Antwerp was a great success, and we have two very important people to thank for that: personal friends of the choir's co-chairman, PATRICK SEEGERS and INGE PEPPERMANS, set up concerts and meals for the choir and thanks to all of their contacts, we experienced a stay well planned and can think back on yet another great choir trip. After Summerbreak we returned back in August, to work on a programme for both Christmas and our next big project: Carmina Burana in March. As Christmas is coming up, we'd like to thank our followers for a magical 2017. See you in 2018! In the autumn of 2015, the choir turned 20 years. But with the packed program for the last part of 2015, we decided to postpone the celebrations until 2016. On 5th February, we had invited the choir with spouses and our previous conductors and choirmembers to a celebration of the jubilee. We started out with a small concert in the church, then we held a reception, and after that we spent a nice evening together, dining, talking reminiscing and singing. 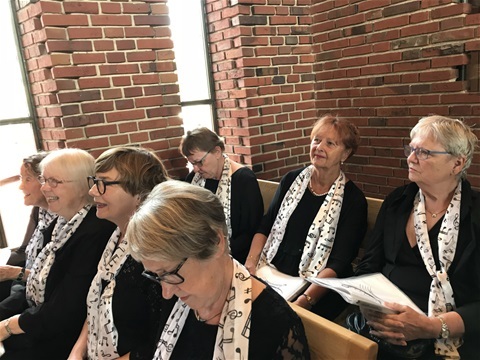 The rest of the Spring season was concentrated around another concert to celebrate the choir jubilee, on 10th April in Hundige Kirke, and to end the Season, a performance in Tivoli Gardens. We wished each other a good Summer at a gathering in Hundige Kirke ind the end of May, where we invited friends and relatives to a small concert, and that concluded the 2015-2016 Season. 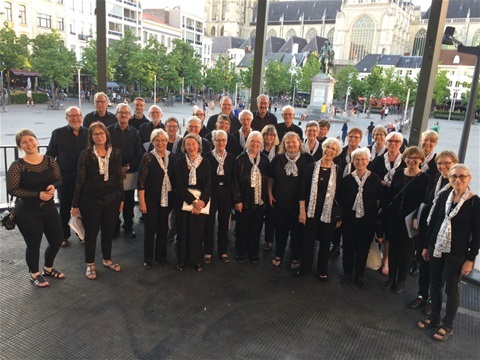 Through Autumn we had a fully packed program, with participation in different gatherings for choirs, preparation for Christmas, Christmas concerts and our upcoming tour that will take us to Antwerp in Belgium in May 2017. We concentrated our Spring activities around performances at our conductor Tina's wedding in April, a concert at Tivoli Gardens' Pantomime Theatre in May, and participation in Hundige Church's anniversary service in the end of June. In the Autumn we took part in a big arrangement called "The Caravan of Choirs" (Korkaravanen), where many choirs came together for a grand concert in "Koncerthuset" (Danish Radio Concert Hall) celebrating the 150th anniversary for the birth of Danish composer Carl Nielsen. Pictures and video HERE. 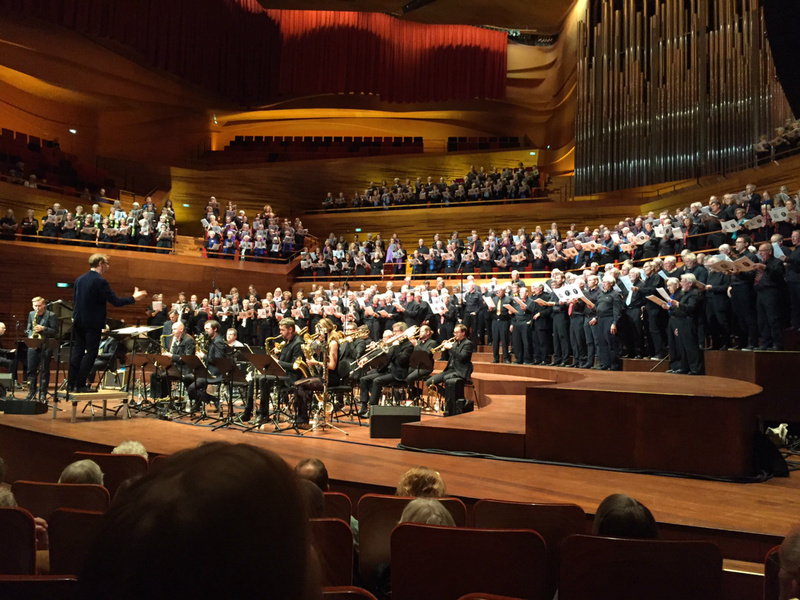 We also took part in another choir festival in Copenhagen arranged by Glostrup Men's Choir. In November the choir gathered for a full weekend rehearsal in Kalundborg, in order to prepare ourselves for our Christmas concerts and performances. In December we rounded up the year. First at the traditional 9 Readings in Hundige Kirke, and on 19th December we had a Christmas concert like none before. The concert was in Mosede Kirke, arranged by Niels Kjølhede, and the theme for the concert was "Christmas around the world". We went to places like Australia, Poland, Spain, Germany, England and the Scandinavian countries. Musically, that is. The church was absolutely full, and it was a wonderful feeling to perform such a terrific program to the enthusiastic audience. Spring season was concentrated on our Tromsø concert tour. See under Choir Travels. During the autumn season we took part in a revival of the former Bethesda concerts together with other inspiring choirs. - There was also a deanery concert with a selection of deanery choirs taking part, and last, but not least, our usual peak season with Christmas concerts.